Around one third of all State maintained schools in Britain have a religious character. This amounts to some 6,850 schools out of a total of approximately 21,000 State maintained schools. Unlike the situation in many parts of the world, faith schooling in Britain has a long history of a relationship with, and financial support from the State. 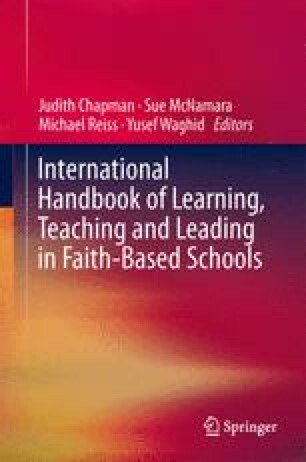 This dual system of maintained schools supported by faith organisations that exist alongside schools without a religious character is therefore at the heart of the school system in Britain. Successive British governments have continued to support faith schools to the present day. Within this system, approximately 60 % of all Jewish children in the UK are educated in Jewish faith schools. This chapter will review the historical context for the development of Jewish schools in the UK, explaining how social, cultural, political and demographic changes have affected the framework and content of Jewish education. An identification of the current issues and challenges facing Jewish faith schools in twenty-first century Britain will follow, focusing on external influencing factors as well as issues from within the Jewish community.